In St. Paul, there’s a high below 1 degree Fahrenheit today. It was -14 degrees when I got up and pressed the button for coffee this morning. I stayed home, cried throughout the inauguration, and did what any self-respecting, frozen food blogger would do. 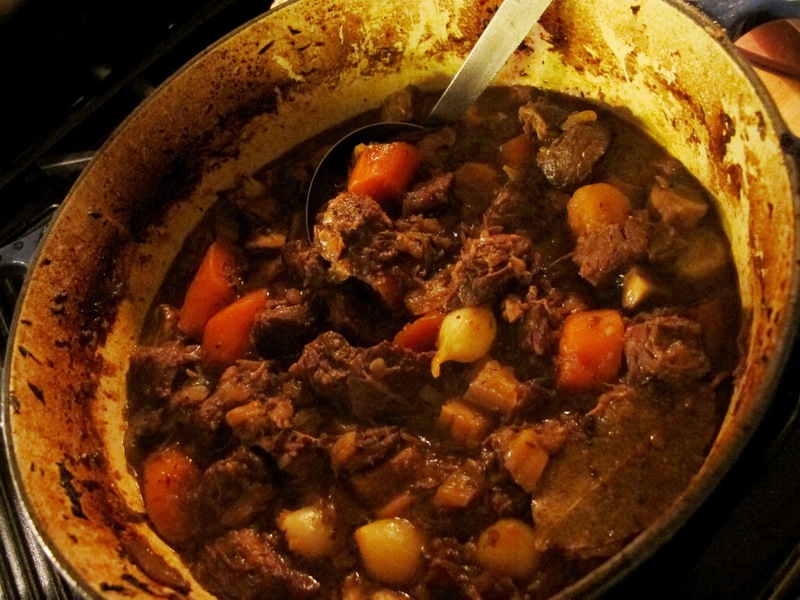 I made beef burgundy…or boeuf bourguignon… If you can spell it, you can make it. The inauguration poet, Richard Blanco’s poem, “One Today” was one of the highlights for me. The other was James Taylor singing “America the Beautiful,” of course. The speech was so, so fine. ANYWAY….After all the stir! 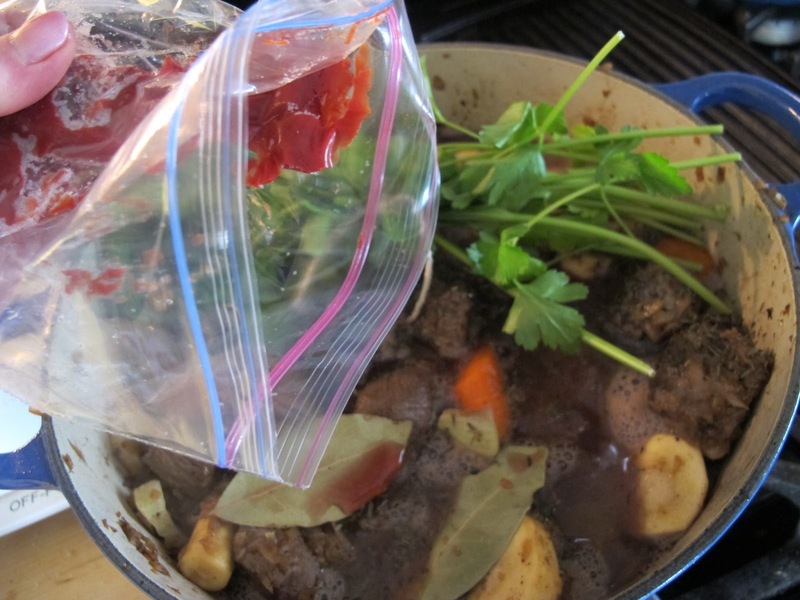 about Julie and Julia for all that time….and all the hype about boeuf bourguignon, I think we may have come down to earth. I no longer hear neighbors rolling the name of the dish around their hungry tongues and the Meryl Streep or Amy Adams talk is long past the appetizing roles of Julia and Julie. 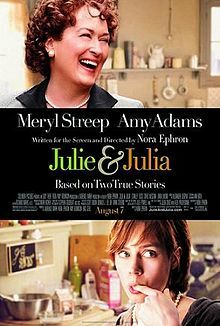 For the record, I’d love a whole movie about Julia starring Meryl Streep. Sadly director Nora Ephron last year crossed the river and is now surely writing all kinds of wonderful things God doesn’t require her to any longer sell. Beef burgundy, after all, is just beef cooked in burgundy–which is simply–and not so simply– a lovely French wine made in the Burgundy area of France from Pinot Noir grapes. (We make incredible burgundy here in the states–visit Oregon and taste their perfect Pinot Noirs. See below for a brief note about that.) I won’t tell if you cook the beef in some other red wine that you just happen to have or in beef stock if that’s your preference. Of course, then it wouldn’t be beef burgundy. It would be beef cooked in red wine or beef stew. And the feeling that it’s not beef burgundy if it’s not made according to Julia’s recipe is just not right. HELLO! Is beef stew not beef stew if we don’t make it exactly like our mother did or the same as some cookbook recipe? There are, I’d guess, many French cooks who cook up beef and Burgundy with a few other additions. (Though the French are sticklers for form. See below for a French blogger’s take/photos on the dish.) The typical beef burgundy recipe is, like many French dishes, short on vegetables, and long on directions. While mine still takes 3 hours in the oven, I’ve made a few short-cuts, and added a few more vegetables for health and balance. It’s worth doing a day (or night) ahead and just heating up if you’d like to serve it for company. You then can focus on dessert, the table, work, or giving the house a lick and a promise. I love that we make most dishes with what’s available or what we need to cook or eat. (I buy several big chuck roasts when they’re on sale at Whole Foods. Then I’m ready for really cold-day meals. My big freezer is, however, in the garage; I have to brave the below zero temps to bring in the meat!) 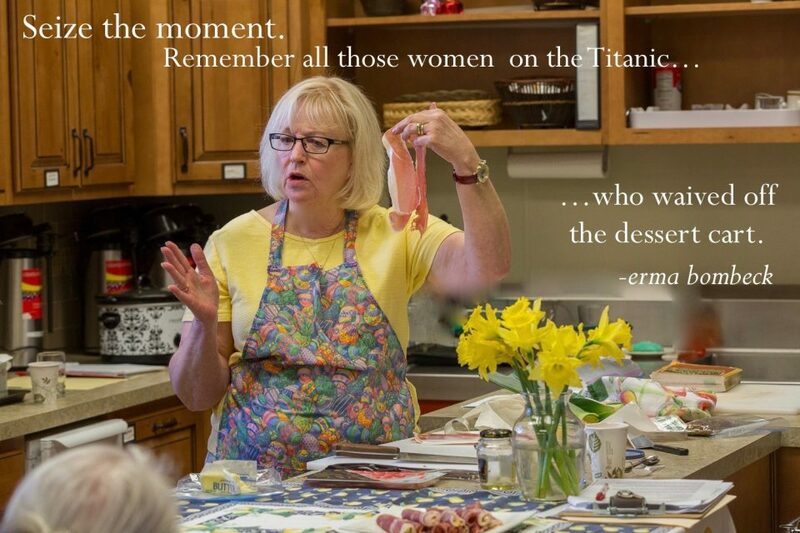 We are not bound to anything written down on earth or on the internet or on Grandma Sadie’s well-worn and stained recipe cards. Use your heart and use your God-given imagination. Turn on the stove, dream, and cook. And while you’re at it, enjoy feeding someone; they’ll enjoy eating this, I promise. 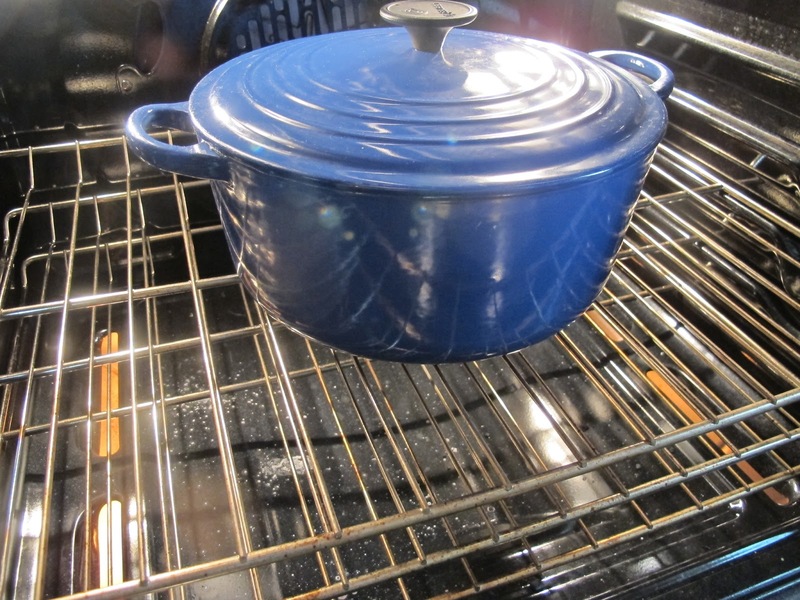 In a 6-8-quart Dutch oven or oven-safe pot, heat 1 tablespoon each olive oil and butter over medium flame. Add 2 cups thawed frozen pearl onions and 8 ounces of cut-in-half button mushrooms. Sprinkle with a generous pinch each of black pepper and dried thyme. Let brown, then stir, and let cook a bit more until tender. Remove from pot, cool, and refrigerate until later. To the pot, add 3 chopped pieces of bacon and let cook until nearly done. Remove from pot, cool, and refrigerate until later along with the onions and mushrooms. 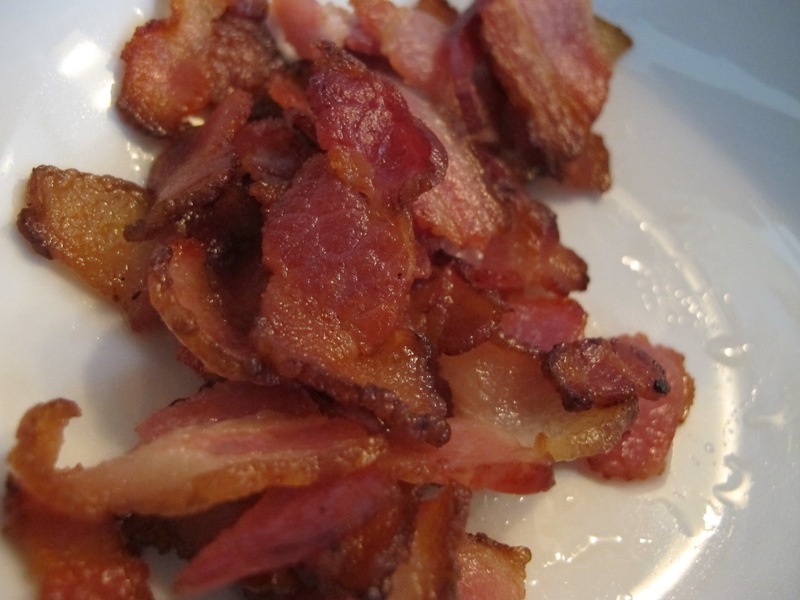 Leave bacon fat in pan. In 3 batches, brown very well 3 pounds of beef chuck roast, cut into 1-2 inch pieces, dried with towels, floured, salted and peppered. (If the pan becomes too dry, add a tablespoon of butter or olive oil. All the brown in the bottom of the pan will come up later.) When last batch is nearly browned, add 2 finely chopped yellow onions, 2 finely chopped stalks of celery, and 3 chopped cloves of garlic. Let cook a couple of minutes, stirring, and pour in 1/4 cup brandy (or red wine) and bring to a boil. Stir to bring up bits at bottom if the onions didn’t do the job. Let cook 2-3 minutes, stirring. Add the beef you browned earlier back into the pot and stir. 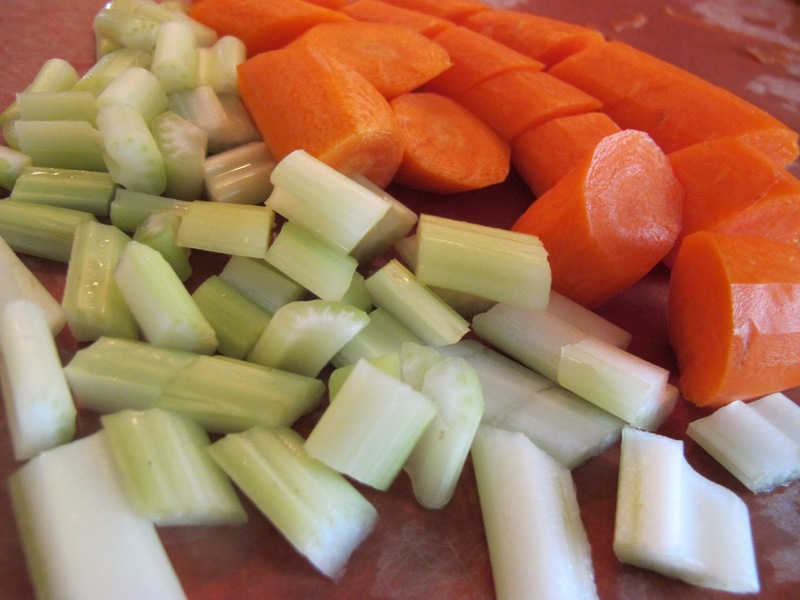 To pot, add 3 peeled carrots cut into 1–2 inch pieces, 2 each peeled and sliced parsnips and turnips (small), and 1 cored and sliced fennel bulb. Stir in 1 tablespoon dried thyme, 2 Turkish bay leaves, and 1 tablespoon tomato paste. Tie up a half-bunch of parsley and lay it on top. Taste and, if necessary (and I think it is), sprinkle vegetables with 1/2 teaspoon kosher salt, 1/4 teaspoon fresh ground pepper, and, if desired (I desire), a pinch of crushed red pepper. 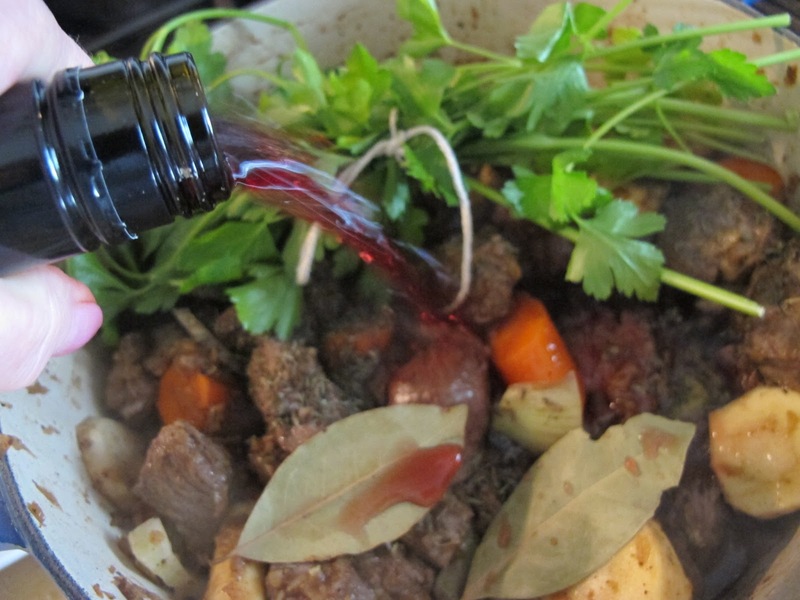 Pour a 750ml bottle of Burgundy (Pinot Noir) or red Rhone wine and 2 cups beef or chicken stock over all. Cover and place in oven. Taste and adjust seasonings if necessary. If too thin, thicken stove top with the addition of a tablespoon or two of flour whisked into 1/4 cup water or wine. Stir in and bring to a boil, cooking until thickened up a bit. 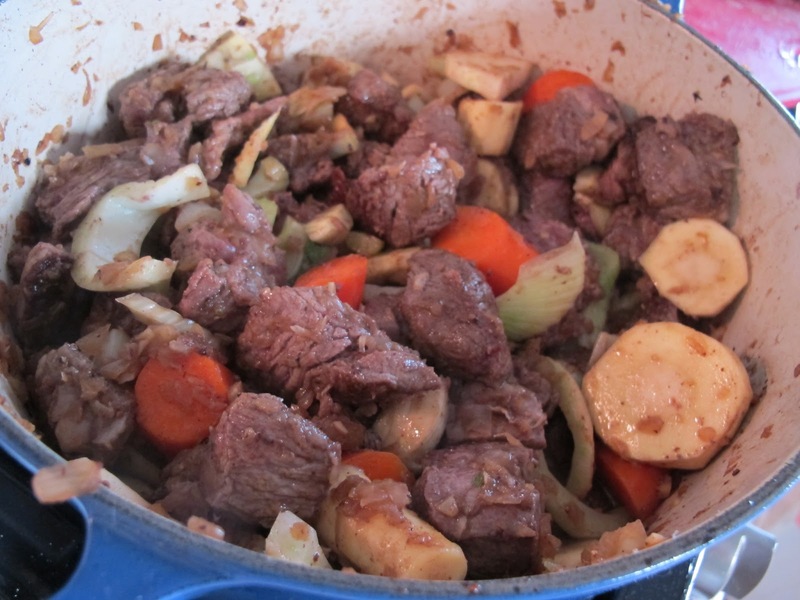 ** If stew is too thick, add 1-2 cups of chicken or beef stock (not wine) or water and let heat again stovetop. Taste and re-season if necessary. I like the stew to be loose enough for dunking bread (as I note) or for mashing up a root vegetable in. In other words, you need the gravy. Serve hot garnished with a little chopped fresh parsley or, if not needed until tomorrow, cool totally, cover, and refrigerate overnight. Next day, re-heat over low flame slowly, covered, stirring often for a half hour or so. It should come to a boil at least briefly before serving. I like it best with big chunks of baguette for dunking, though the usual suspects are new potatoes or, according to my French teacher, egg noodles. Typically a little green salad with vinaigrette is served here in the states with the beef. I also like it with some quickly steamed green beans and a drizzle of mustard-vinaigrette as a salad. It’s nice to have something with a bit of crunch for contrast. Serve with Pinot Noir ^^ or French Burgundy. **You can also use equal amounts of butter and flour, mashed together (buerre manie)–perhaps a tablespoon or two each. 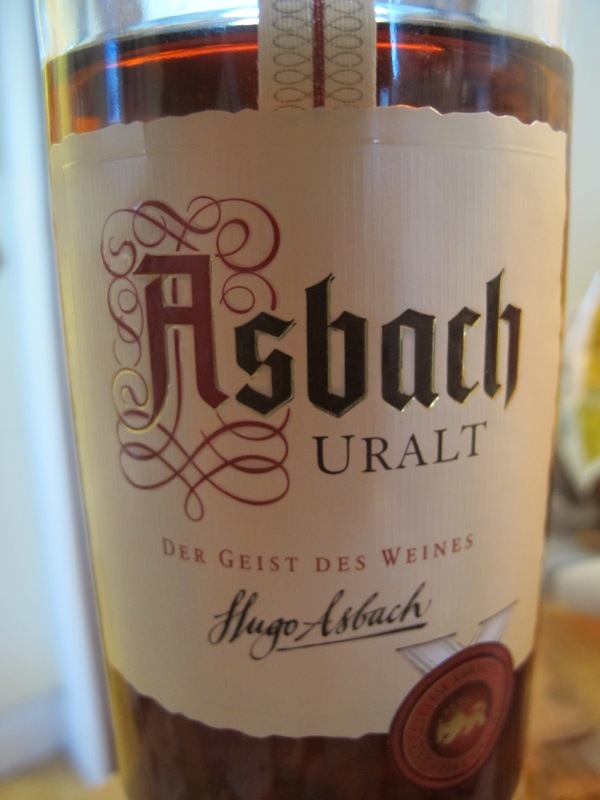 I had no French brandy or cognac; I do keep Asbach Uralt in the house. I used an inexpensive A-Z Pinot (2008) for cooking. I freeze tomato paste in small bags and just take out what I need. Quality Burgundy (French) is pretty pricey, though there are some at lower price points worth drinking. Check at the wine shop if you’re set on a European wine. ^^There are many great Oregon Pinots--Sineann, Ken Wright, Cristom, Bethel Heights, WillaKenzie, Soter, Privé, Domaine Serene, and more… Read about Oregon Pinots here, though F&W gives a different list of favorite wineries. These are, mostly, special occasion wines ($40 and up), but a couple of vineyards are producing lower-priced or entry level Oregon Pinots (Ken Wright –$30–and Tony Soter–$20– that I know of). Beef Burgundy is worth a special occasion wine like an Oregon Pinot Noir. It’s a fine meal you don’t make too often. But….if you really can’t splurge for the night… A much lower-priced Pinot that’s not a shame to drink might be A-Z or even Angeline. Inexpensive (or cheap) Pinot Noirs aren’t worth drinking. (I’d rather drink coke and be sober is the tag line.) You might want to buy a French Rhone red wine instead, which is a blend often dominated by the Syrah grape, inexpensive, a decent value, and consistently tasty. Ask someone at the wine shop which Rhone they like. Buy three bottles if you can; one to cook with, one to drink, and one for leftovers. You could try different producers and see which you like best. 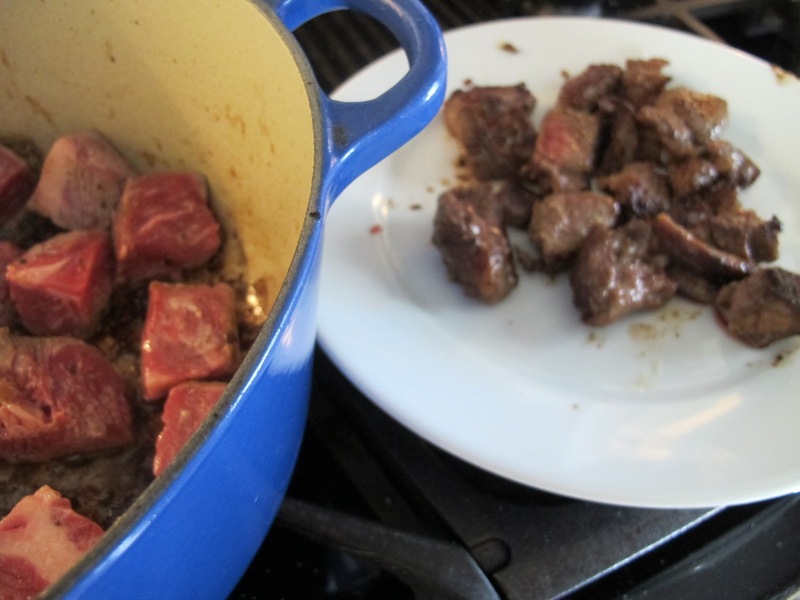 Even quicker Beef Burgundy made with sirloin steak stovetop. 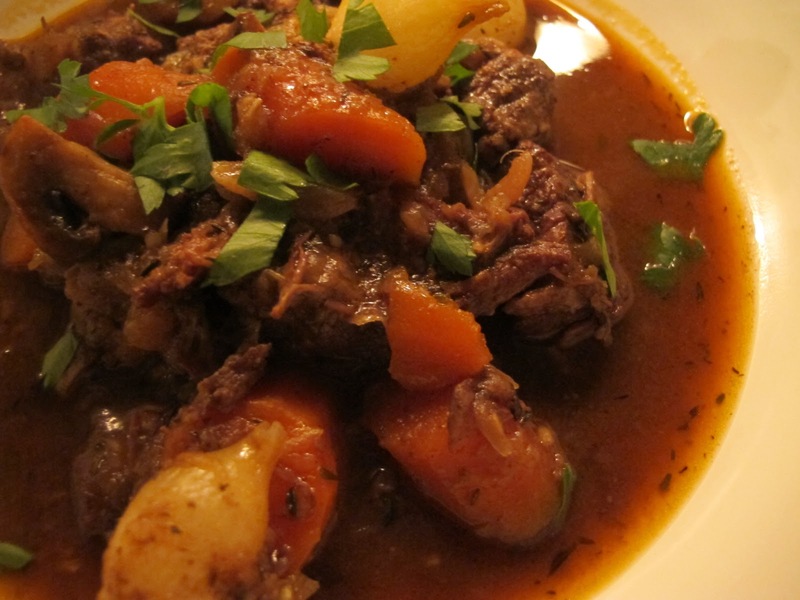 A French food blogger’s boeuf-bourguignon with lots of photographs. Want to watch Julia’s first French Chef show on how to make Boeuf Bourguignon? It’s very entertaining and there’s tons to learn! See her taste the stew out of the cooking spoon… Note her washing machine and dryer in the kitchen and hear her say SEWTAY.